Subject: Blue Spoon Coffee Co. I've always been curious what kind of coffee Wall Street traders would drink as they get ready for their crazy days. Fortunately for at least the NYC Financial District, there are a few coffee places relatively close by to grab a quality cup of joe. One that seems outfitted for the working Manhattan-ite on the go is a place called the Blue Spoon Coffee Company, a small coffeehouse located right on Chambers Street open only during the traditional M-F work week. I had made a few attempts to stop by over the years but since I rarely went up to New York City during the week, stopping in proved difficult. Finally, I had an excuse one day to stop by early during the rush hour commute of a Monday (which might I add, navigating the subway with that much chaos is no fun) and hence, I wandered over to their shop. The venue sits in a cute cafe with a metal exterior with decent windows and a quaint inside with a good deal of spacious seating for the space. The coffee comes from Intelligentsia, and from what I understand Blue Spoon stands as one of the first in NYC to peddle the Chicago coffee. I had the Blue Spoon Blend, a coffee that purveyed a fiery spice on the front that ended subtly in rice pudding. The espresso, pulled short and by practiced hands, had sweet notes of strawberries and cream as well strong hints of cocoa. I didn't spot the tea. As I had been waiting to go to Blue Spoon for a while, I was glad that it delivered on my hopes of it being worth the trip. 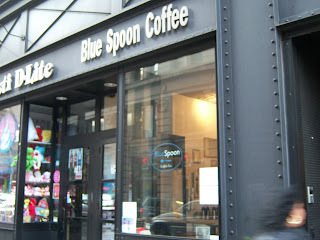 If you happen to be south in Manhattan during the work week, make a detour to the Blue Spoon Coffee Co. I definitely want to read more on this blog soon. By the way, pretty nice design you have at this site, but how about changing it once in a few months?